Did the NFL actually just have a crazy trade deadline?! I don’t know about you but I can’t recall the last time there was this many notable trades on the last week of a NFL trade deadline. Let’s not forget, there’s been trades going down all year! We tend to see notable trades happen more frequently and consistently with NBA and MLB but definitely not in the NFL. Early on Sammy Watkins was traded to the Rams, Jordan Matthews was traded to the Bills, a month ago we saw the AP experiment in New Orleans come to end as he was traded to the Cardinals and 3 time Pro Bowler Duane Brown was traded to the Seahawks. Don’t know about any of you but I love seeing trades throughout the season. It adds excitement and completely shakes things up from the norm. I mean sure, you’ll have your random trade here and there but notable trades don’t come too often in the middle of a football season. Within the past few days, as the kids would say, “It was lit!” with trades. We wanted to break down the two biggest trades for fantasy purposes and let you know what the impact will be and what to expect moving forward. A last minute trade sent the former FSU WR Benjamin to the Bills. This was rather surprising considering Benjamin has been one of Cam’s favorite targets the past few seasons. This is one of those situations where it may work well for Benjamin in real life but for fantasy it may not do too much. For Buffalo, who’s best pass catching target has been LeSean McCoy, it adds another weapon. For Carolina, it means they will now have more speed on the field with Curtis Samuel more than likely seeing an increase in snaps. Fantasy Impact: This is a slight downgrade for Kelvin as he’s now entering a run first offense. He went from a quarterback who has averaged close to 500 attempts a season the past three seasons to one who has only thrown over 430 once in the past three seasons. The Bills offense runs through Shady and Benjamin’s ceiling isn’t high and honestly feel like his floor isn’t going to be steady either. As far as the Panthers, the best impact this has is for Christian McCaffrey. His targets and production should go up. Devin Funchess is now the clear cut number one receiver so his production will get a slight upgrade as well. For Jonathan Stewart, doesn’t improve his situation much as he’s still a touchdown dependent running back. This was the most shocking trade of the season and with the biggest name. For people here in Miami, it automatically was felt and for the majority of fans I’ve spoken to, it wasn’t received well. Many felt as if they deserved more than a 4th round pick but what has Jay Ajayi really done? Has he been that effective and that much of a great runner or were Dolphins fans hyping him up too much? We can’t forget, he tore his ACL in 2011, his knees have always been in question and he was held out most of 2015 with a hamstring injury. Even this offseason his knees were a problem and was held out for some of training camp. Can’t take away from having three 200 games in the 2016 season but the rest of that season he ran over 79 yards in a game only once. The offensive line wasn’t intact the majority of the 2016 season and the line in 2017 has severely underperformed so it’s hard to to really know Ajayi’s capabilities are. What we do know is, he was NOT utilized in the passing game much with Adam Gase despite being the first FBS player with 1,800 yards running and 500 yards catching in a season while at Boise State. Fantasy Impact: For the Dolphins, Damien Williams and Kenyon Drake will split the backfield. In college at Alabama, Kenyon Drake was never the feature back and was more of the passing back. He’s not someone who should get bulk of the work but reports out of Miami are he will get first crack at lead back. Damien Williams will start as the pass catching back which is odd to me. Kenyon Drake should be the pass catching back and Damien Williams should carry the workload in my opinion. Either way, don’t expect high ceilings since the backfield will be split right down the middle. It’s a toss up and this situation is similar to what’s happening in Dallas with their backfield but the YUGE difference is, Dolphins o-line is ranked 31 in run block efficiency according to footballoutsiders.com. You could pick either or up to see how it pans out but definitely wouldn’t be starting either or this week unless I REALLY needed to. If Ajayi, a more talented runner than both struggled behind the Fins offensive line, no reason to think any of those two can be more successful. As far as Ajayi, to me this an upgrade for him. Offensive line improvement, better scheme and if the Eagles were to utilize his pass catching abilities that the Dolphins did not do too much of, he can very well be a 3 down back. For LeGarette Blount, this is a huge hit production wise. He’s listed as the starter for this week’s game but not sure how long he will retain that role. This trade was also a total RIP moment for Wendell Smallwood and any other Eagles running back. You can easily drop any those guys in your leagues. 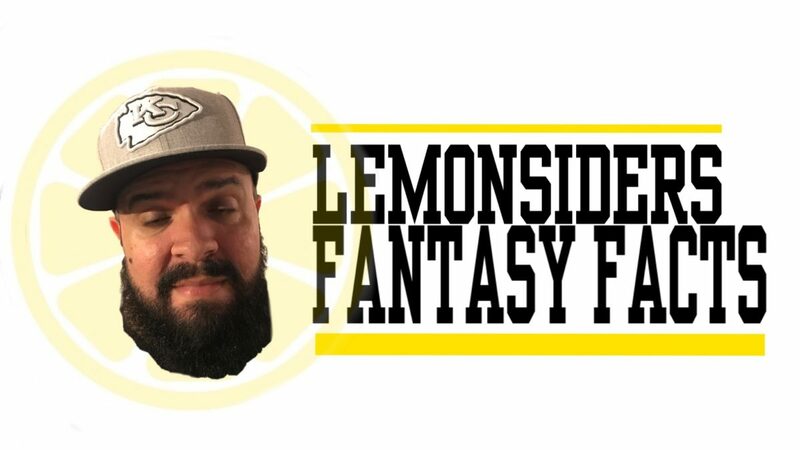 Be sure to check with us each week where will discuss not only start, bust alerts and sleepers for that particular week, but also who you should be adding to your roster and who you should be dropping. Until then, enjoy your week Lemon Heads!